Barbara & Company is part of Pearl Street's dynamic East End. 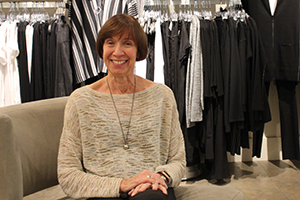 Owner Kathy King personally reviews and orders each designer’s line she carries and travels frequently in order to create the highest quality collections for her store. Every year, Kathy and her team support the people and community who helped them build the boutique, supporting food drives, special sales benefiting local relief funds and sponsoring fundraising community events throughout the year. After all, giving back never goes out of style! An overnight stay in downtown Boulder has become a holiday tradition for us. It starts with an early lunch at Dushanbe Teahouse, always beautiful but like a jewel at this time of year. I especially enjoy the tea-based drinks on the menu like Stormy Earl Grey. After lunch, we'll spend the afternoon shopping in some of our favorite stores like Peppercorn, Boulder Arts & Crafts Gallery and Into the Wind. The Boulder Book Store and Ku Cha House of Tea (I love tea) are also on the list. Then we head to our hotel! The holiday lights on Pearl Street are not to be missed (almost like the tulips, but not quite). We alternate each year between the contemporary comfort of the St Julien with its Flatiron views and the Hotel Boulderado's historic Victorian suites. Dinner is always a special event - so many fabulous restaurants! This time it's the Black Cat. The next morning we have breakfast at Snooze and then head home wishing we could start all over again. Because there is always something happening! Ku Cha House of Tea is a traditional Chinese tea house. We provide over 150 premium loose leaf teas at our specialty shop. Create your own unique teas at our Blend-Your-Own-Tea bar. Boulder's premier location for service and hospitality that are legendary. A national register historic landmark, featuring 160 rooms and suites, 8,000 square feet of meeting space, and three restaurants and lounges.